I am posting on my Tablet, meaning it’s one letter at a time. We’ll see how long that lasts. I thought in lieu of my usual Wrist to Forehead Sunday post, I would give an update on our yard. I confess, it is not looking good. But I am going to accentuate the positive, as the song says, so I just now went out and took a few pretty pictures. I hope. The sun was so bright, I couldn’t always see what I was shooting. 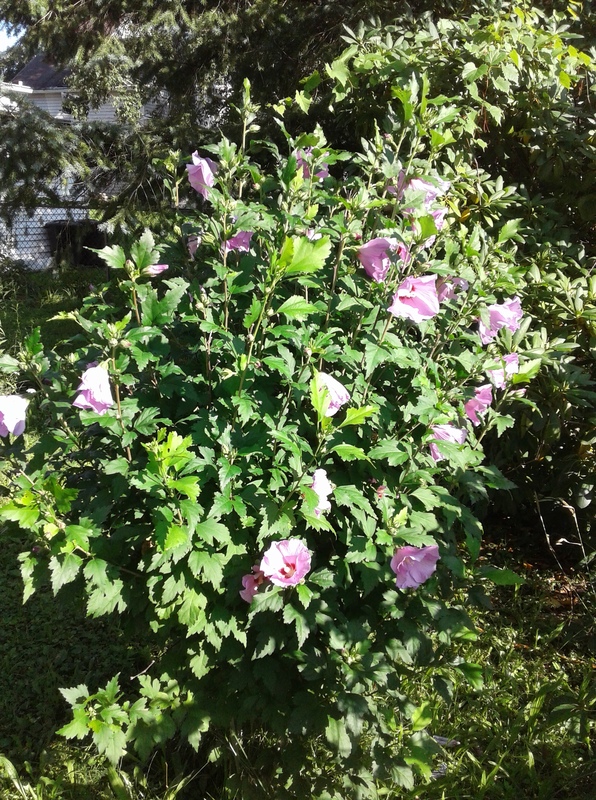 Steven has been quite pleased with our Rose of Sharon. 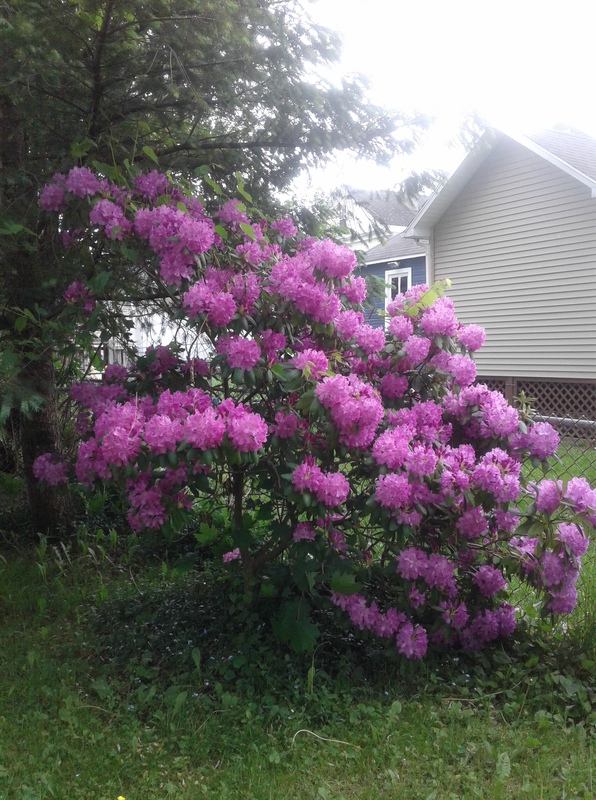 The Rose of Sharon should be proud of herself, too, considering how many times she was mowed over when she was just a wee sprout (I’m just guessing it is a girl, because, you know, Rose, Sharon) (Rosey Grier and Sherry Boehlert notwithstanding). Fewer shadows in this shot. 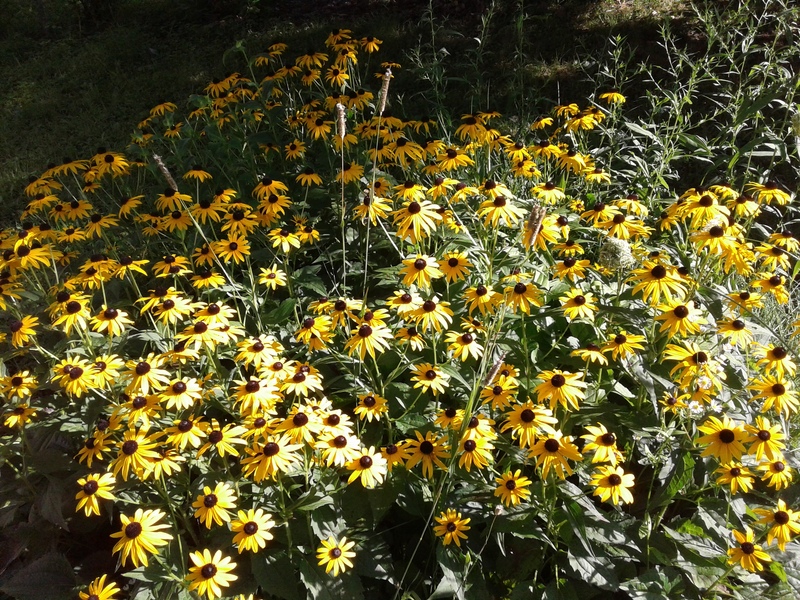 Our Black Eyed Susans are looking well, too, and spread further every year. It would not bother me much if they took over the whole yard, but I guess that might take a few more years. They are also called Rudbeckia. 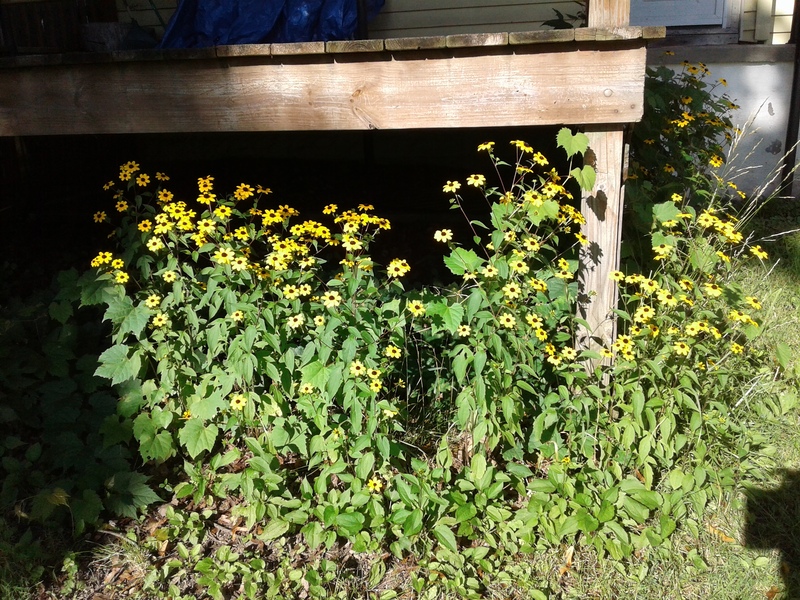 Our Brown Eyed Susans just magically appeared one year and have spread as well. Now they are on two sides of the deck. I studiously avoided photographing the shabbiest sections of the lawn. Maybe I’ll try to do something about it before the leaves fall. Or maybe I’ll just let the leaves fall and cover it all up. That’s called making a virtue out of necessity. Posted in humor, personal and tagged flowers, gardening, Lawn, wrist to forehead. Bookmark the permalink. Let’s see if I can finish my Wuss-out Wednesday post before my ride to rehearsal gets here. Rehearsal is for Spring Into Murder, the interactive murder mystery dinner theatre at Morning Star Methodist Church in Ilion, NY on Saturday, April 28. I’ll try to get a number for tickets, in case any local readers are interested. 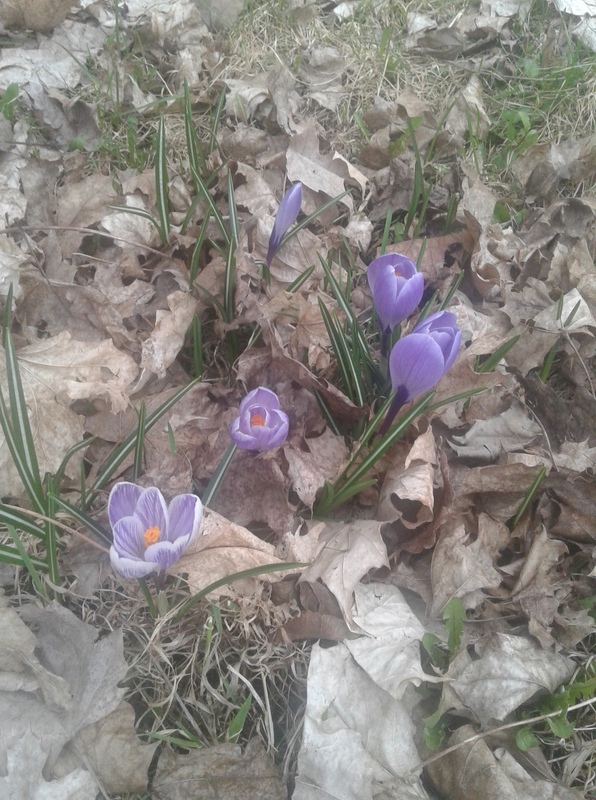 In the meantime, I thought I would write about spring. WHAT SPRING???? you may well ask. I ask it too. My thermostat said it was 41 degrees out this afternoon. I am in desperate need of exercise, so I went for a walk. I love to walk and thought I might be able to write a decent Pedestrian Post about it, but I’m afraid it was a depressing walk. Everything was brown and crappy-looking. We are over half-way through April, for heavens’ sake. Would a few flowers, maybe some green spouts, buds on the trees be too much to ask for? Apparently so. Additionally, I have some things on my mind which I will not bore you with (Freudian typo: I started to put “now bore you with,” which tells me it is boring of me to mention them at all, so sorry). Note the brown grass. Tsk, tsk. 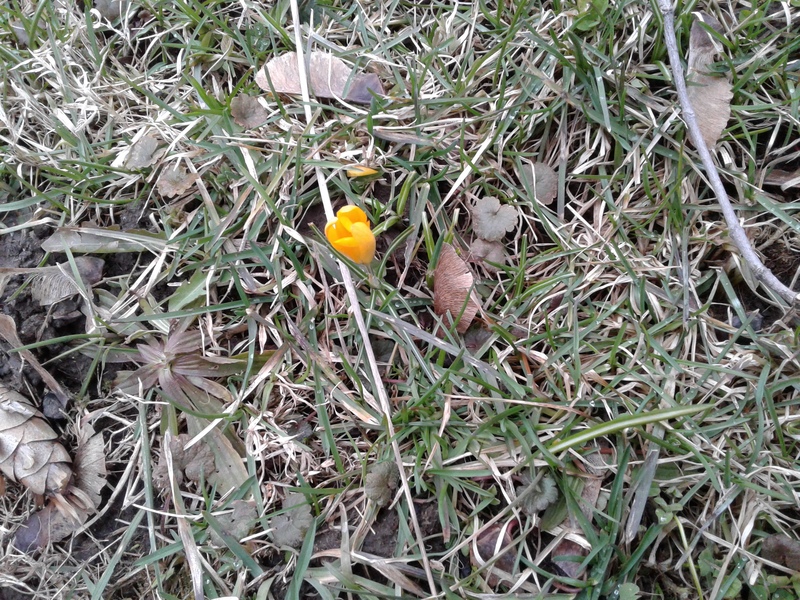 I went out front, to see if there were any more crocuses. 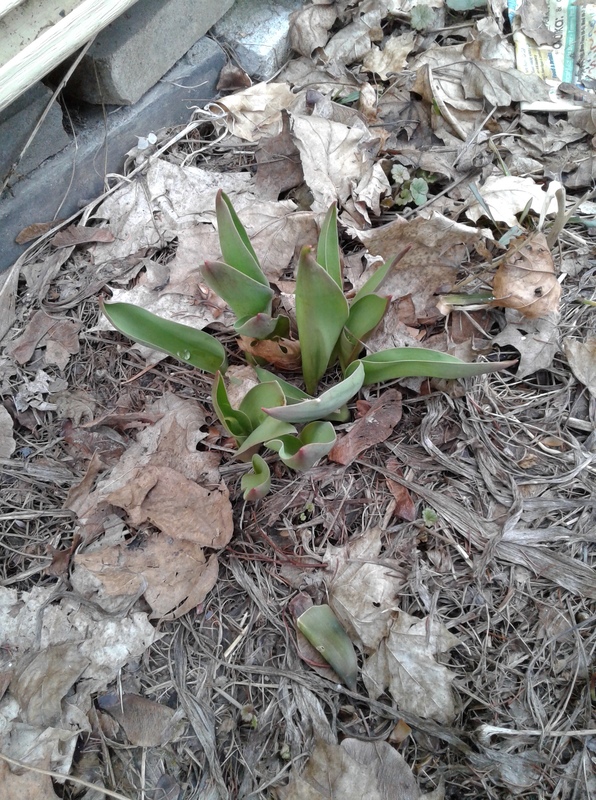 There were not, but I saw some green stuff that might eventually be tulips and lilies of the valley. I think this is the tulip. I think these are lilies of the valley. As you can also see, I have some yard work to do. There are lots of last year’s leaves still to be raked, and some garbage to be picked up. It isn’t my garbage; it blew there in one of the recent wind storms. At least nobody came along and dropped a house on me. 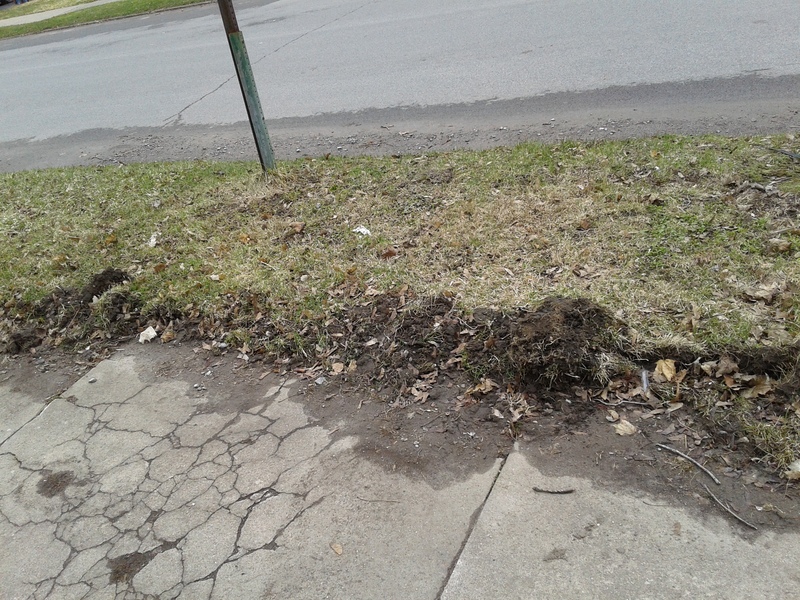 While I was out front, I took a picture of what the sidewalk plow did to us, and to almost everybody else in the village. I had wanted a “before” picture of that, so when I fix it I can see what a good job I did (or not, let’s be honest). You know, I think those are new cracks in the sidewalk as well. Damn! Look at me, I’m over 400 words! I think that’s fine for a Wuss-out Wednesday! Now I’d better get ready for rehearsal. There is nothing like a little murder to perk things up midway through the week. 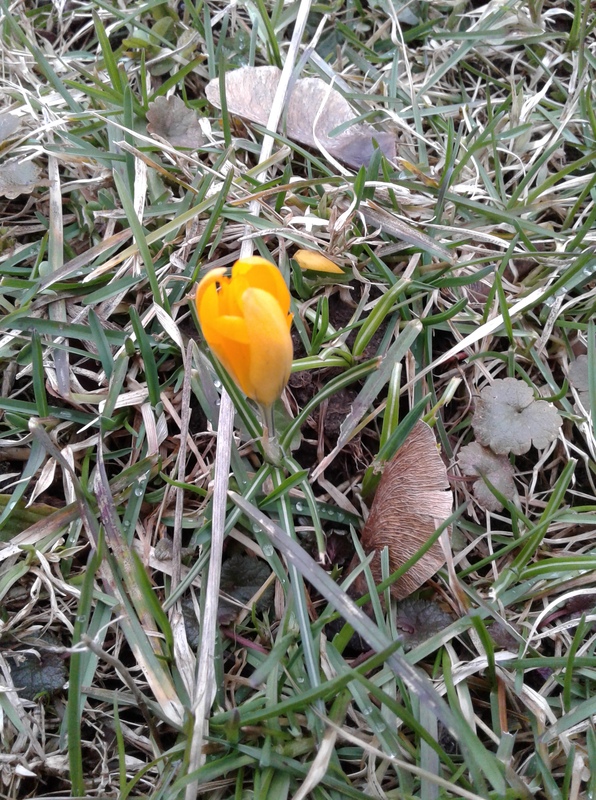 Posted in humor, personal, Wuss Out Wednesday and tagged blog post, blogging, crocuses, flowers, lilies of the valley, rehearsal, spring, Spring into Murder, tulips, walking, weather. Bookmark the permalink. So I had a real post yesterday and I am not going to continue the trend. I’m exhausted! Never mind what all I did after work (and work wasn’t easy). I ran around, I wrote some stuff, I did some housework. I did not work out. Don’t judge me. Oh, what do I care? Go ahead and judge me! I’m pathetic! Oh dear, that sounded suspiciously like whining. I apologize. I recently made the observation that we do not have the luxury of giving in to despair. I guess I don’t even get to be too tired to make a blog post. Well, too tired to make a good blog post. But perhaps I can rouse myself enough to say something reasonably entertaining. I was looking for a related picture when I remembered: It is Non-Sequitur Thursday! I can be random as well as silly! 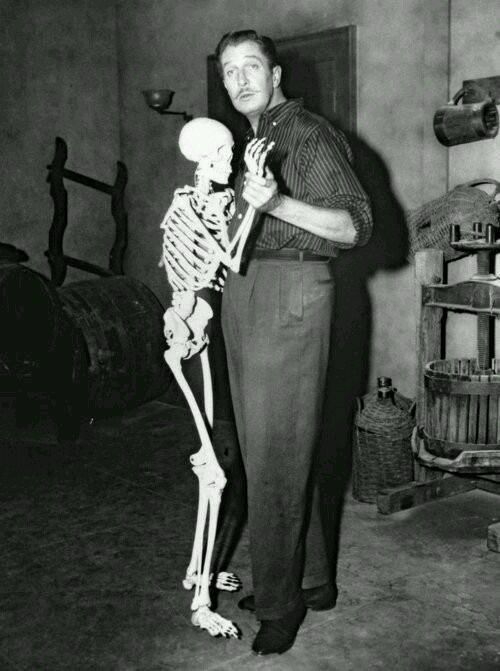 So here is Vincent Price dancing with a skeleton. Who doesn’t love Vincent Price? If you just raised your hand, you are probably reading the wrong blog. However, I will not judge. Love whoever you like! 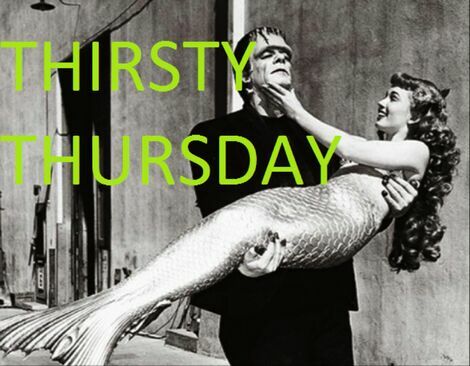 Speaking of Thirsty Thursday (see first picture), I think I’ll have a glass of wine. Posted in humor, Non Sequitur Thursday, personal and tagged blog post, blogging, flowers, monsters, movies, non sequitur, sarcasm, tired. Bookmark the permalink. 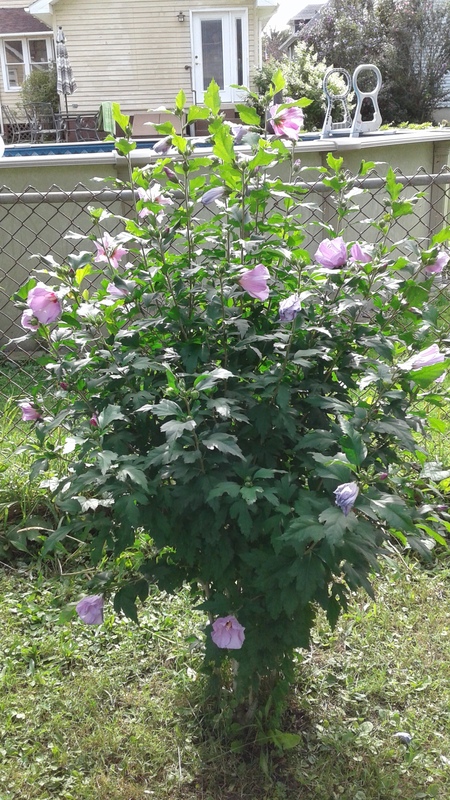 Steven has been wanting to get a picture of our Rose of Sharon in the back yard. I finally got one today and thought, hey, let’s do a Backyard Picture Post. 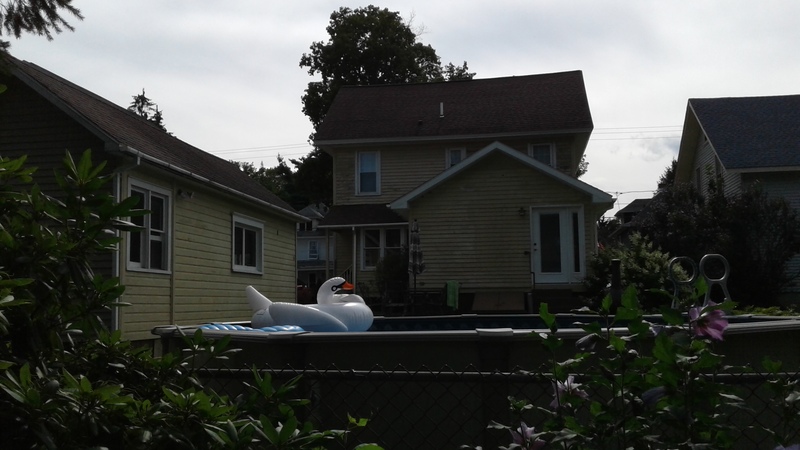 While I was taking the picture of the Rose of Sharon, I noticed the swan in our neighbors’ pool which Steven has been envying (I have been envying the pool myself). The picture is a little dark, but I wanted to share the swan. 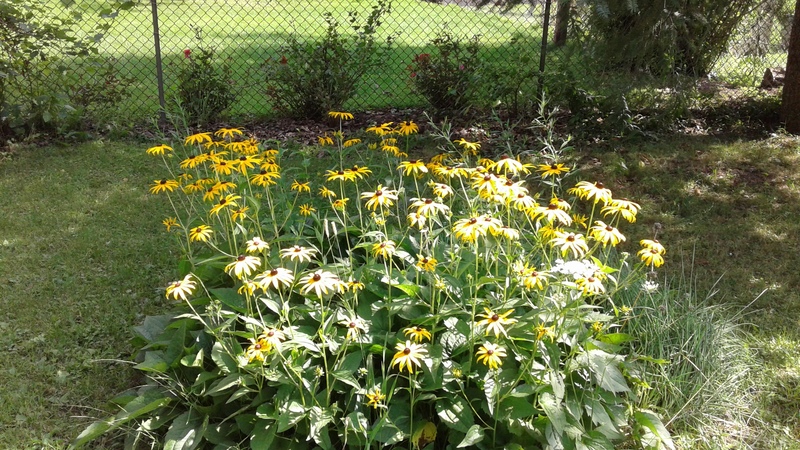 I had also been wanting to take another picture of our Black-eyed Susans, which are looking better and better. I don’t know if you can see that a little Queen Anne’s Lace has worked it way in. 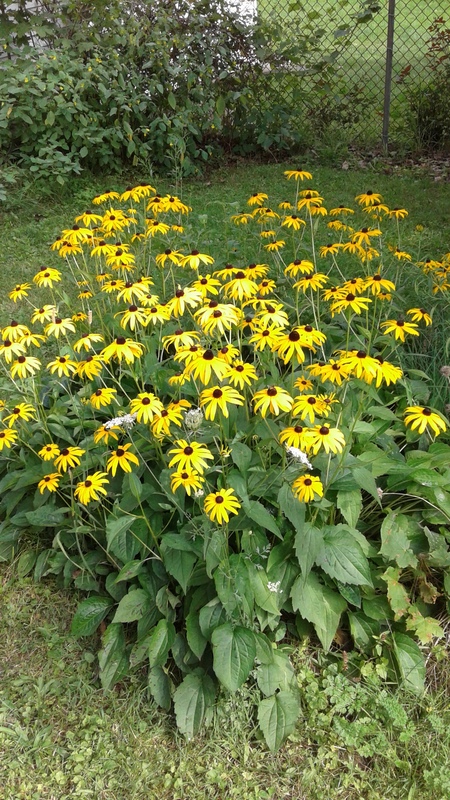 We originally purchased the Black-eyed Susans at a sale to benefit the Herkimer County Humane Society, back in 2011 (are you impressed that I remember the actual year? I am). They have gotten bigger and spread. Now they are battling it out with the chives for control of that little patch. 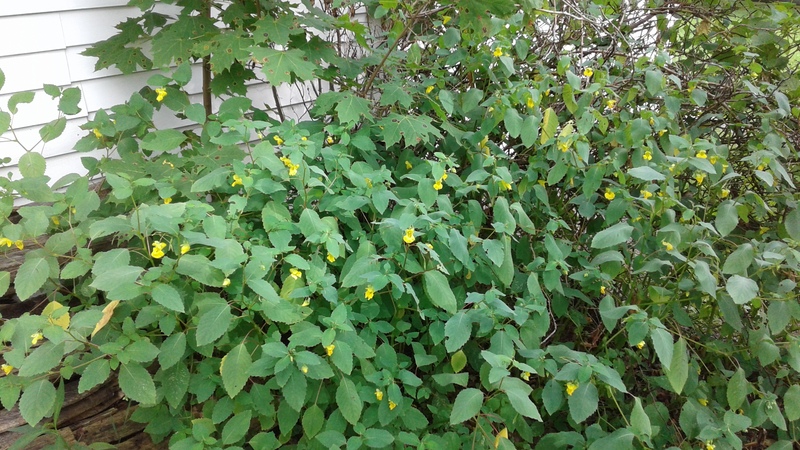 While I was admiring them, I noticed some little yellow flowers behind the garage. 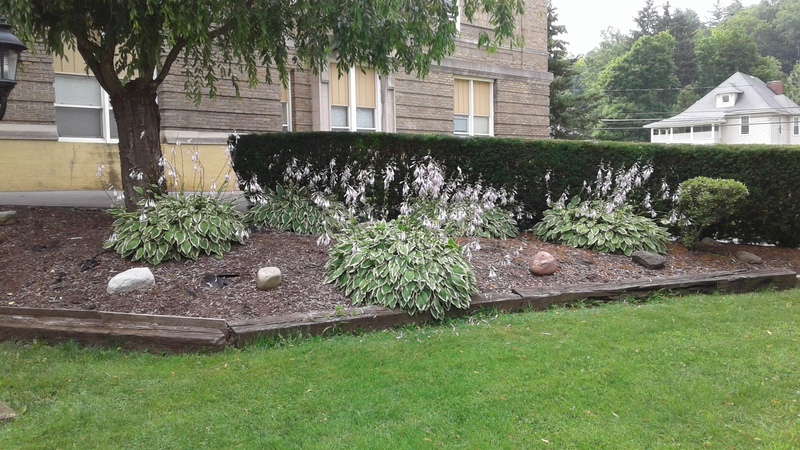 The little blooms look better in person, but if you want to stop over and see them, please call first. I really need to clean out behind the garage, cutting down a pricker bush that is expanding to tree-like proportions. We just never see that part when we are sitting on the deck, and, you know how it goes: out of sight, out of what’s left of my mind. 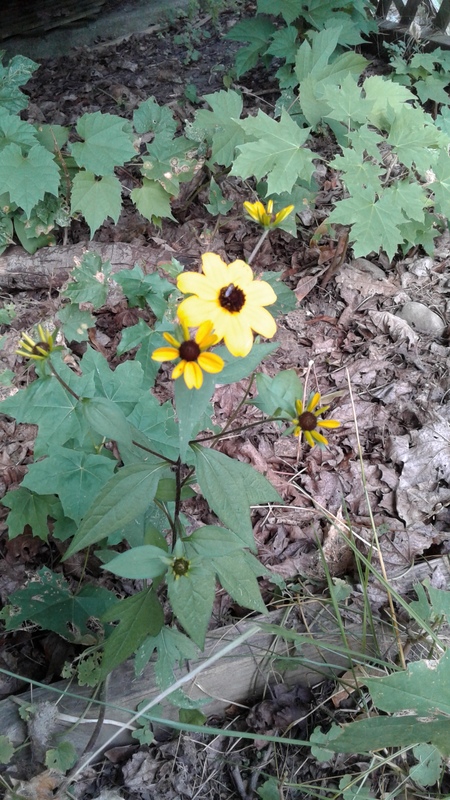 Then I remembered the Brown-eyed Susans, which grew with no input on our part. 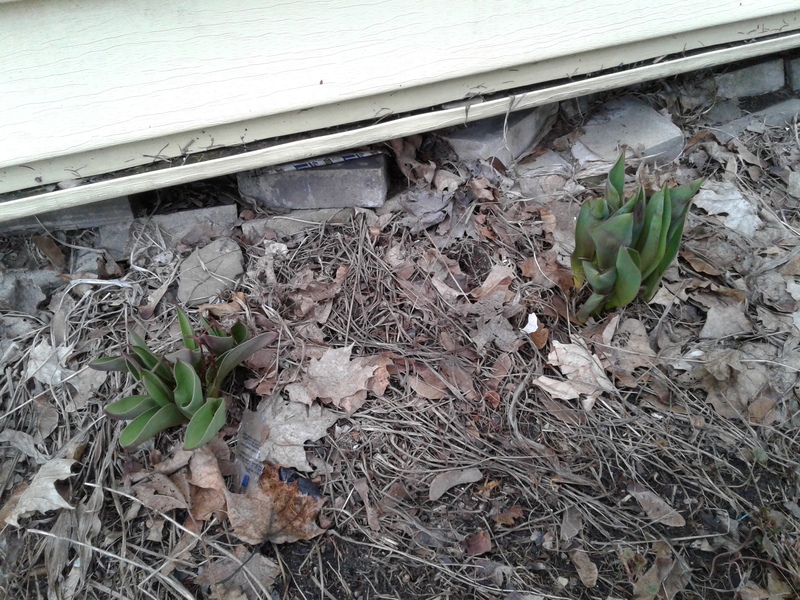 The green shoots are part of some irises which are done blooming now. 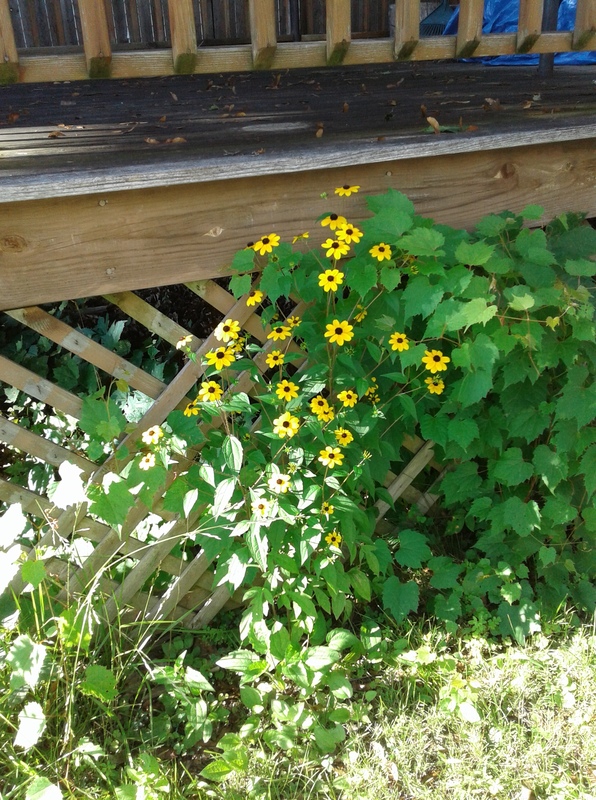 The Brown-eyed Susans are growing in two places in our yard, so I took two pictures. The green stuff in the background is the beginning of some trees that I need to get out from under my deck. Some years ago, I read the Rudbeckia is a good plant for bees. Imagine my surprise when a guy at a greenhouse told me that Rudbeckia is Brown-eyed Susans. It sounds so much fancier! So this is how pretty my yard looks in mid-August. I wonder what September will bring. Will it be worth a blog post? We’ll see. 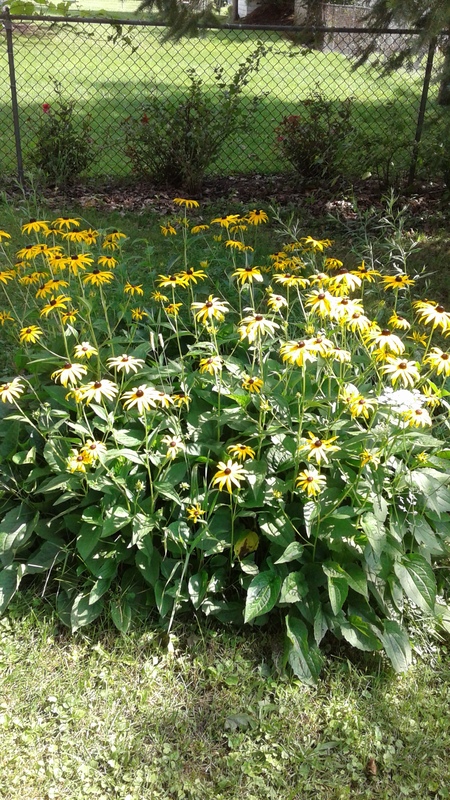 Posted in humor, personal, Uncategorized and tagged back yard, black eyed susans, blooming flowers, brown eyed susans, flowers, garden, gardening, rose of sharon, rudbeckia. Bookmark the permalink. I wanted to have another Severed Head Sunday. I thought it would happen when Steven agreed to watch The Brain That Wouldn’t Die, one of my all-time favorite cheesy movies. From there we could have gone onto a number of other features, cheesy or otherwise: Hush… Hush, Sweet Charlotte, Straitjacket, Sleepy Hollow (or, as I like to call it, The Headless Everybody), even Jaws has a scene with a severed head (I believe Jaws was a feature of my first Severed Head Sunday). Then we decided to go for a walk, because I finished a letter I wanted to mail. I brought along the Tablet and took some pictures, so why not do a Sunday Stroll post? 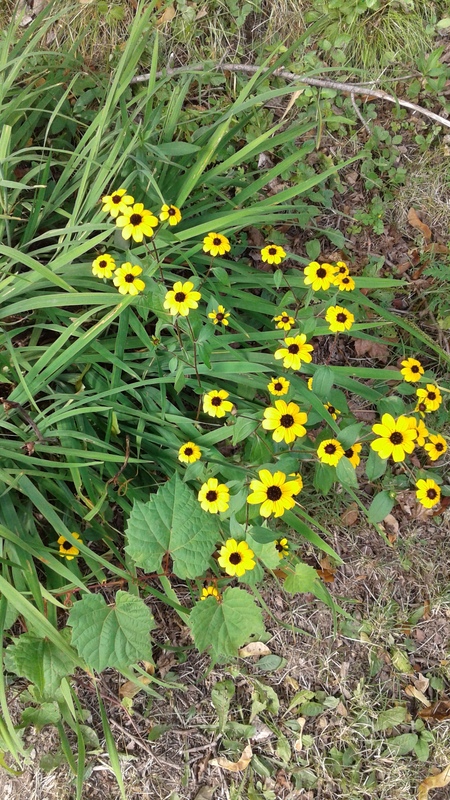 While Steven was changing his shoes, I went into the backyard and got a picture of our Black-eyed Susans that I have been wanting. The three bushes in the background are in the neighbors’ yard. I took two shots, thinking to use the best one, but I now I think I’ll use both. I don’t know if you can tell, but we’ve got quite a nice batch of chives next to the Black-eyed Susans. 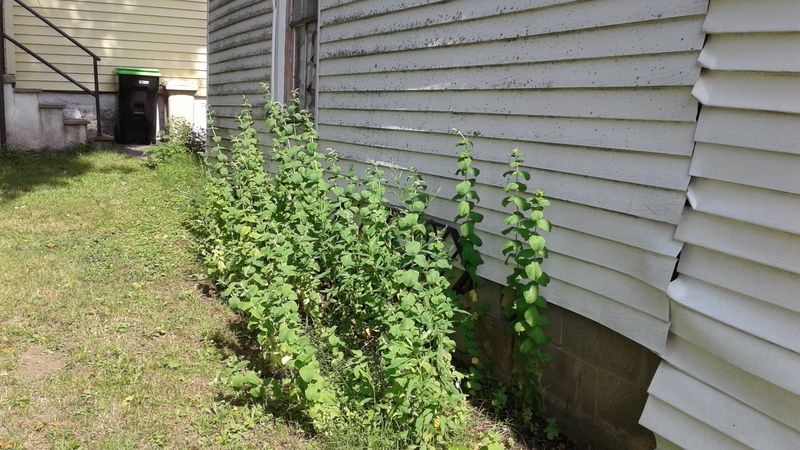 I had just been remarking to Steven that our spearmint seems a little out of control, so I got a shot of that, too. I should have gotten Steven to stand next to it for perspective. I was glad I had taken two pictures at home, because I did not find as much to shoot on our walk. 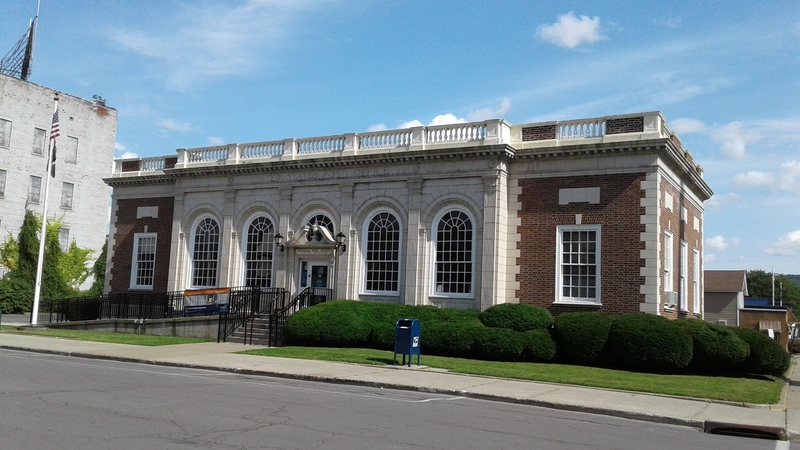 However, I knew I wanted a picture of our post office, because I think it is kind of cool and historic looking. I stood across the street so I could get the whole building. 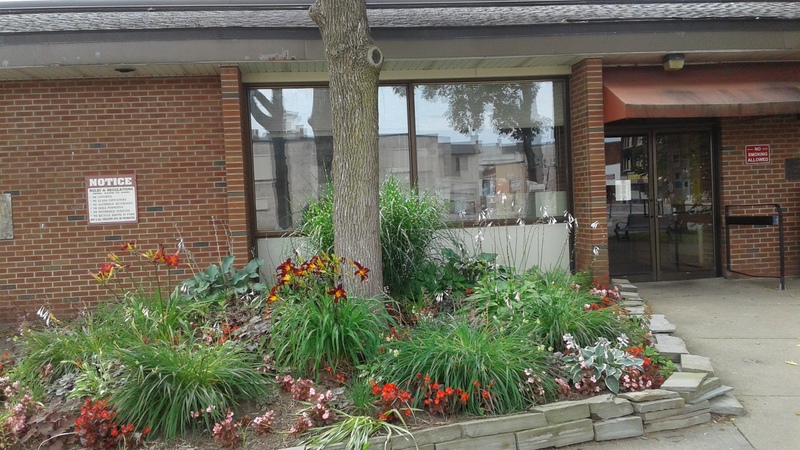 As we walked up Main Street, I saw some flowers in front of Basloe Library which I had not taken a picture of, I don’t think. I think I only took a shot of the ones in the park next to the library. 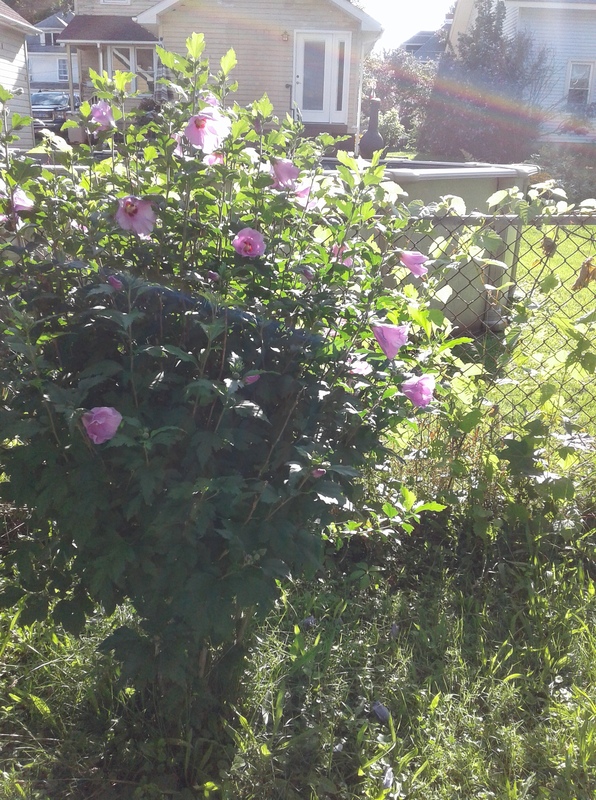 I wish I had focused in on the big pink blooms more, but you can’t see on the Tablet really well in the sunshine. I was glad to get back home, because it was hotter outside than I had thought. Also, I had not worn my sunglasses and the bright sunlight was bothering me. Just to piss and moan a little, so this is more of a Wrist to Forehead Sunday after all. However, my headline promised a Scattered Sunday and I began by talking about movies, so I will close with a photo I downloaded from one of my monster movie groups on Facebook. Is it just me or does the building in the background look a little like Stone Mill at Canal Place in Little Falls? 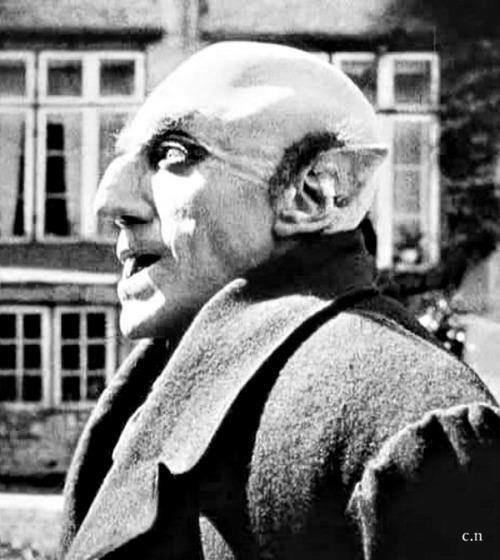 It is a rare close up of Max Schrek in make-up as Nosferatu, who, as regular readers know, is one of my all-time favorite guys. Happy Sunday, everyone. Posted in blogging, humor, personal and tagged Basloe Library, blog post, flowers, Max Shreck, Nosferatu, pedestrian post, pictures, post office, Severed Head Sunday, Sunday, Sunday Stroll. Bookmark the permalink. Steven and I decided to take a little stroll after dinner, so I brought along my Tablet to take a few pictures. It was a lovely afternoon for a stroll. 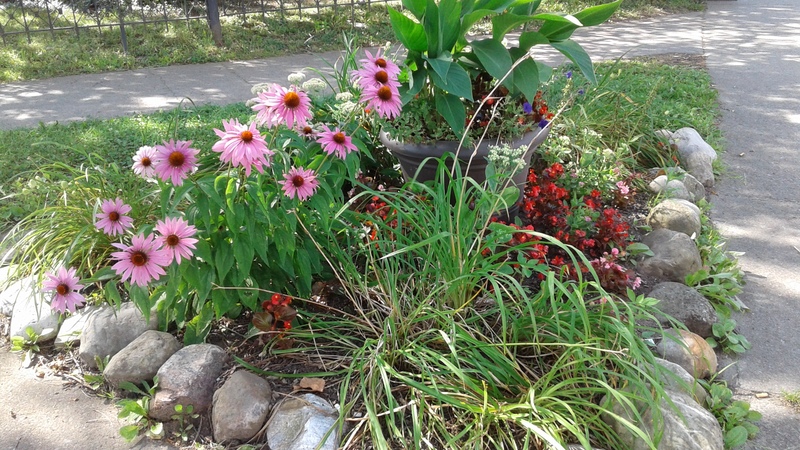 After stopping to chat with neighbor, I saw some flowers I wanted to snap. This is an apartment building that used to be a school. Hmm… I guess that one did not come out very clearly, but I liked the purple flowers. Maybe I’ll go back after dark and try to get a picture of these lit up. 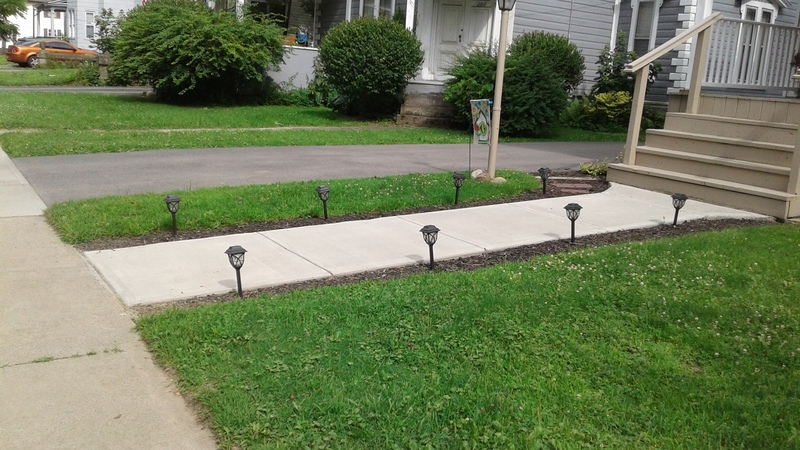 Steven noticed some solar lights and wondered if ours still work. We did not put them out this year. It’s kind of a rebuilding year for our lawn; we have not done much with it except get the nice young man who lives across the street to mow it for us. Steven thinks this would make a delightful movie/opera house. Eventually we turned down Main Street, and I suggested I take a picture of this building, which we have long admired. The “for sale” sign that I had noticed there previously was gone. I wondered if somebody had bought it or if they were just doing the trick of taking the sign down for a while so when they put it back up folks will think it is a new listing. I love the color; the picture does not fully do it justice. Continuing down the street, we saw a building that had seen better days, but there was one lovely flower in front of it, so I took its picture. Soon we were approaching the Historic Four Corners, which regular readers may recall is a favorite spot of mine. I wrote a blog post about this cemetery once, a long time ago. 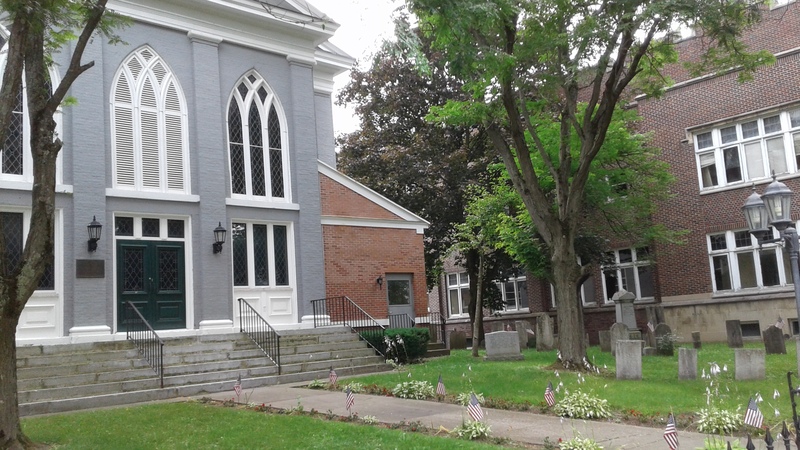 This is the Herkimer Reformed Church. I love the old gravestones. 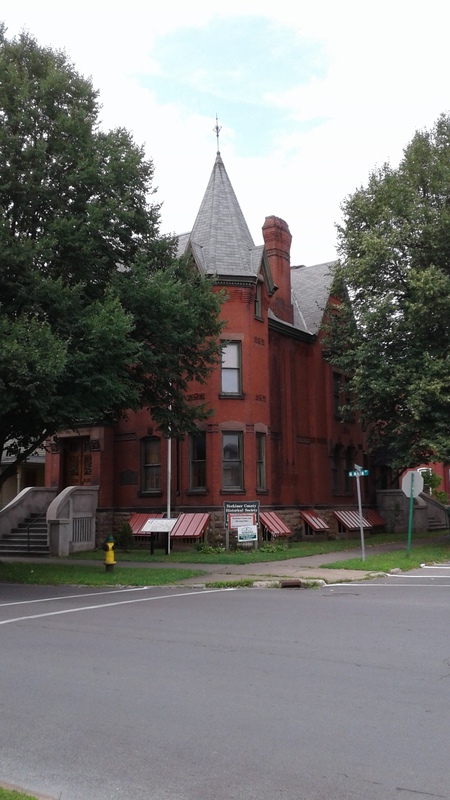 Next I wanted a shot of the Suiter House, home of the Herkimer County Historical Society. It’s even more interesting inside. 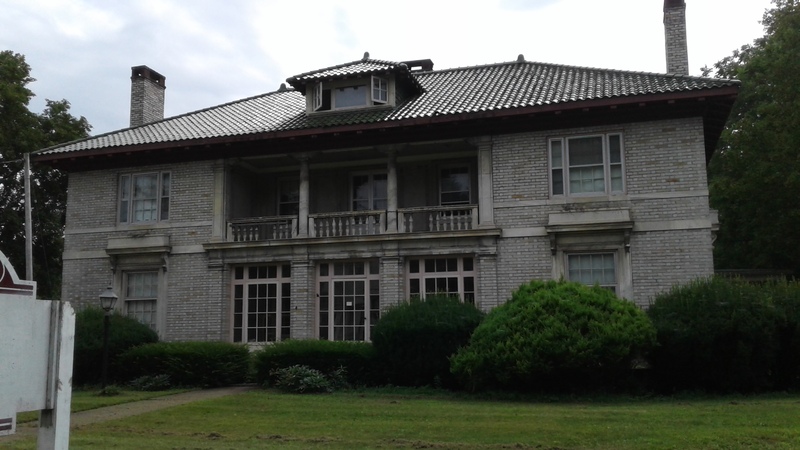 The house was built by Dr. A. Walter Suiter, who played a pivotal role in the trials of Chester Gillette and Roxalana Druse, two famous historical murderers of the area. Steven played Dr. Suiter in the play Roxy, presented by the Historical Society at Ilion Little Theatre in 2015 (I played Roxy. Perhaps you read a few of my blog posts about it). 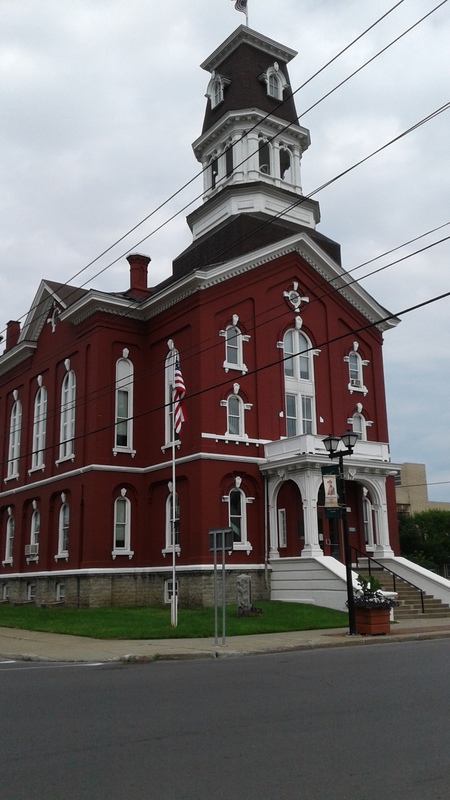 Across the street is the Herkimer County Courthouse, where Chester Gillette and Roxalana Druse were tried for their respective murders. 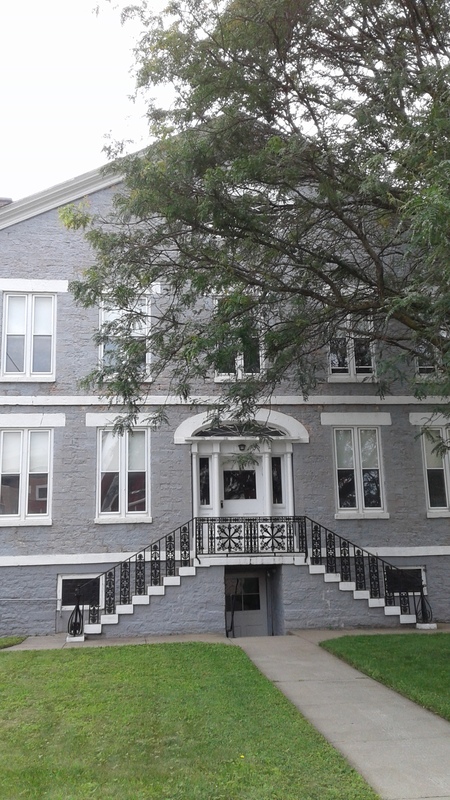 Of course I had to take a picture of the 1834 Jail, which housed both Gillette and Druse. Who put that tree in the way! 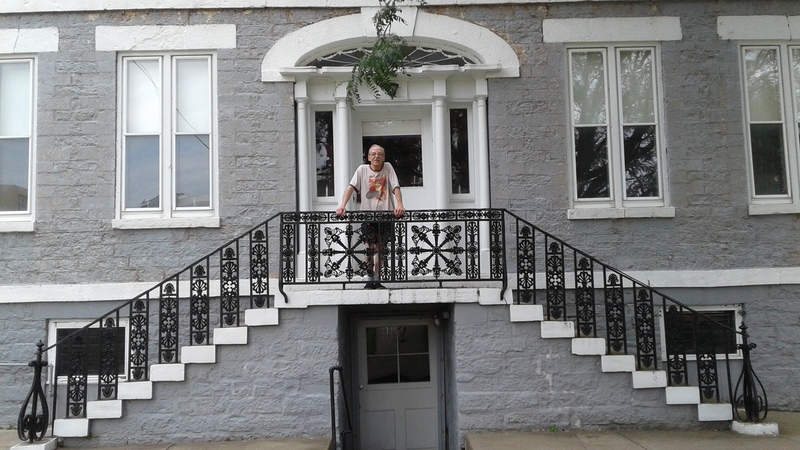 Steven suggested I take a picture of him on the steps. “Try to look like Dr. Suiter,” I suggested. “In my party shorts with my Mr. Incredible t-shirt,” he said, as if he thought that was a problem. He just smiled handsomely instead. “Romeo, Romeo, wherefore are thou…” Oh, wait. Wrong play. 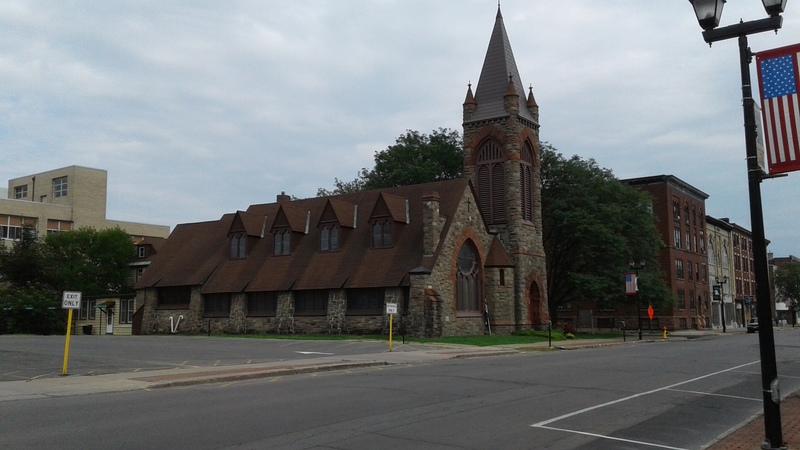 Continuing down Main Street, I took a picture of Christ Episcopal Church. 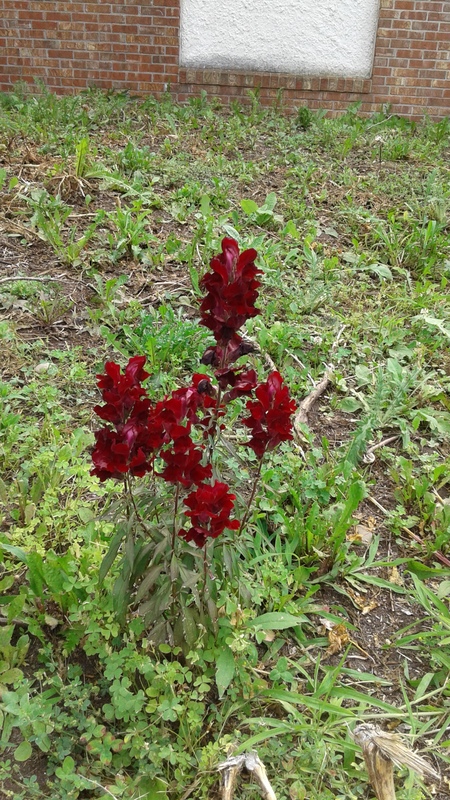 We cut though the little park next to Basloe Library (another of my favorite places), and I got a picture of some nice flowers. I did not read the NOTICE on the building. I hope it did not say not to take pictures of the flowers. After that, I thought I had taken enough pictures, so we continued our walk back home. Now I see I am over 550 words and I have successfully avoided having another Wrist to Forehead Sunday post. I say, not a bad ending to the weekend. Posted in humor, Pedestrain Post, personal and tagged 1834 Jail, architecture, blog post, blogging, Chester Gillette, Dr. A Walter Suiter, flowers, Herkiemer County Courthouse, herkimer county historical society, herkimer ny, Herkimer Reformed Church, Historic Four Corners, pictures, Roxalana Druse, solar lights. Bookmark the permalink.